When I was in my early teens, I was an avid reader of mysteries, science fiction, and horror stories. While my friends were reading romance novels, I was being entertained by Agatha Christie, H.P. Lovecraft, and writers of scary stories published by Scholastic Books. I especially enjoyed collections of short stories of this genre. One short story that I clearly remember was titled “Revelations in Black." It was a gothic horror story. The main character, a young man, entered into a conversation with a mysterious woman he meets while sitting on a park bench at dusk. Whether by luck or plan they continued to meet at the same time and location every evening thereafter. The man was intrigued by this woman, who is always dressed in the same black gown with a veil covering her face. As time passed, the man began to notice that the woman was not quite what she appeared to be and, ultimately, realized that the woman in black was a vampire. Thus, the revelation. The story was dark and did not have a happy ending. Just like the young man in the story, I am drawn to the color black. Black dogs mixed in with a few black and white cats here and there have always been members of my family. 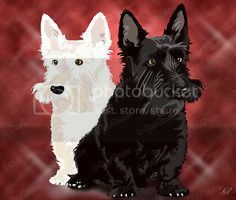 When I growing up we had a black Chow mix named Inky, a black Beagle/Terrier mix I named Lady, and Chivas Regal, a Scottish Terrier. After I married, my parents adopted several black Labs. My sister’s family also had a preference for black Labs and many years ago they had a black cat named Midnight. The first cat my husband and I adopted was a black and white female we named Charlie Chaplin. We currently have four black Scottish Terriers and a male Tuxedo cat named Papillon. All have been great companions. At some point I realized that not everyone is a fan of black dogs and cats. Of course, black cats are burdened by the superstition that having a black cat cross your path is bad luck...and how better to avoid bad luck than to not have a black cat in your home. Black cats and dogs who are unfortunate enough to end up at a shelter are at a great disadvantage. 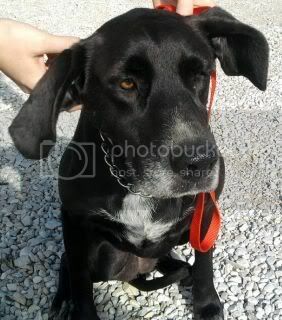 When I see a plea for a black dog, my first thought is, “Oh no... not another one,” and I know that this dog will have a difficult time finding a home or rescue. For many dogs awaiting adoption, the speed with which they find a home may rest not on their breed, gender or age, but on one trait that has no bearing on their personality or temperament. Shelter officials have dubbed it “Black Dog Syndrome” - the propensity of dark-coated animals to be passed over for adoption in favor of their lighter counterparts. Skeptics claim the syndrome is an urban legend, but those who work at shelters and in rescue know the phenomenon is very, very real. To complicate matters even further, black dogs aren’t as photogenic as other dogs and many have white facial hair that gives them the look of an older dog. 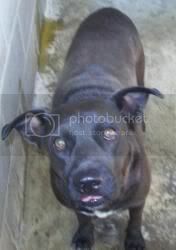 Many of the black dogs in shelters are large dogs. All of these factors make black dogs less likely to be adopted. A dog whose attributes fade into the background of an online photo does not make a good impression to potential adopters or rescuers; a senior dog in a shelter has little hope of salvation; and shelters are overflowing with unwanted large dogs. A large majority of the cats in shelters across the country that never find homes are black. Like black dogs, they are judged by the color of their fur - and not by their character or personality. These beautiful black creatures spend the end of their lives watching all the other animals being adopted into new homes. Ultimately, they are finally chosen for the one thing they do not want: euthanasia. Black cats are the last cats adopted from shelters and rescues because of old myths and superstitions linking them to witches, devils, and bad luck. That is their bad luck! More black cats are euthanized than non-black cats. In 2002, The Journal of Applied Animal Welfare Science published a study that examined the factors that determine the adoption of an animal, including the color of the animal's coat. The study found that potential adopters considered a black cat less desirable and, therefore, increased the cat's risk of euthanasia. The study also revealed that black cats were half as likely to be adopted as tabby cats and two-thirds less likely than white cats. 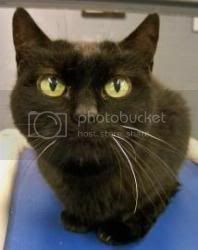 In total, only 20% of the black cats in the study who were offered for adoption were given a chance at a loving home. Sadly, the remaining cats were euthanized. Black cats and dogs like Bev, Isley, and Inky should not become another statistic or part of a gothic horror story with an uphappy ending just because they were born the “wrong” color. Just like we hope that people will judge us by the content of our character and not by the color of our skin, eyes or hair, so too should we not judge animals by the color of their fur. All of the animals in shelters are equally deserving of finding a good home and having a long life. We need to find ways to change their bad luck.